When an electrical storm is imminent it is essential to disconnect all cables from telephone sockets and TV aerial sockets. 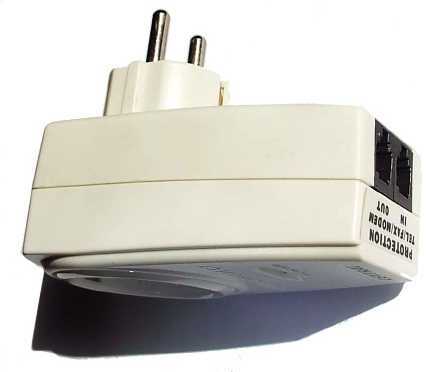 It's also advisable to disconnect all plugs from mains 230v sockets and to disconnect satellite dish LNB feeds. In addition, move leads away from the sockets because lightning can jump huge gaps! You can install some protective measures in case you are not home when an electrical storm arrives. Buy a phone line surge protector*, which looks like a mains adapter. It must be plugged into the nearest mains power socket (for earthing). Connect a lead from the telephone socket to the surge protector. Connect a lead from the surge protector to your Wi-Fi router/modem. Connect your phone to the router/modem. Once a telephone line surge protector has experienced a surge it should be replaced because it will not be as effective the next time. You can also buy mains power strips which include a telephone line surge protector and some form of rudimentary mains surge protection. Electrical appliances should be connected to the mains power socket via an Automatic Voltage Regulator (AVR). 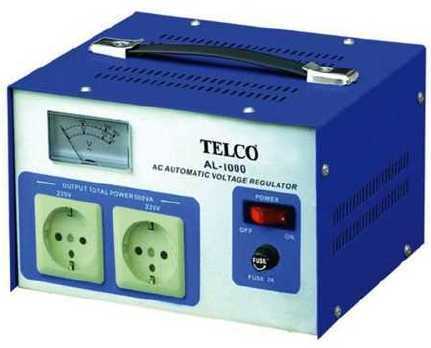 The most common types are rated at 500 Watts and 1000 Watts. Choose one that is suitable for the appliance(s). You might be able to connect more than one item to a single AVR (check the power ratings). A fridge/freezer needs an (AVR) with a timer function so that it doesn't switch off/on repeatedly, since that can destroy a motor. Do NOT connect a mains surge protector into an AVR because it could short-circuit its output. Check with your supplier if you aren't sure. To allow time to shut down your computer and/or other equipment, you can install a UPS. This must be plugged into the AVR output. 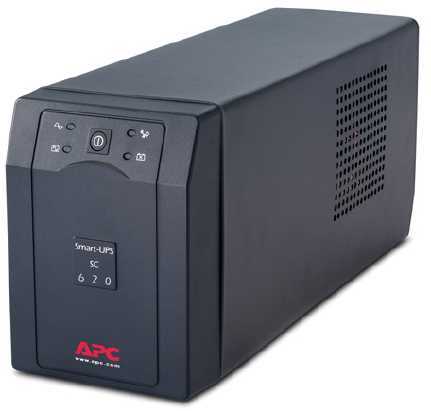 It's important to note that a UPS will NOT afford much (if any) protection against a mains voltage surge. Its only purpose is to maintain power long enough for safe disconnection of the equipment that it is powering, in the event of power failure. It blew the aerial mast off the wall, travelled down the coaxial cable into a linen cupboard and arced across from the TV aerial socket into the mains power socket ten centimetres below. 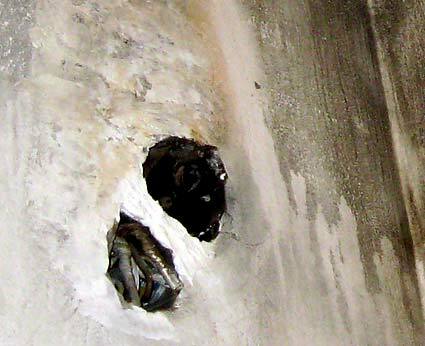 (In doing so, it set fire to sheets in the cupboard - hence the smoke and heat damage to the walls). 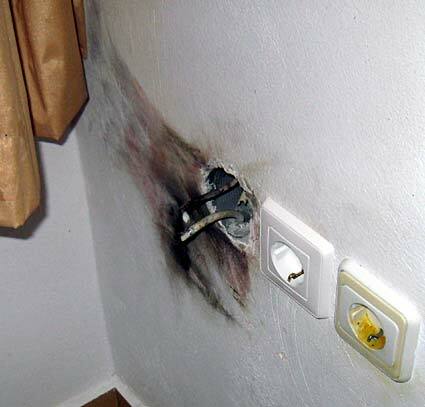 It travelled down the mains and aerial cables, blowing sockets off the walls and dislodging several ceiling lights before reaching the basement and damaging the electronic circuitry of the boiler. It also killed the TV, DVD player and audio Hi-Fi unit. As you can see from the photo, they were very lucky that the curtain didn't go up in flames. Keep curtains and furnishings away from sockets and wiring. When the TV aerial was replaced, it was fitted to a long pole some distance from the house. The cable was run underground in suitable piping. You can reduce the risk of damage by looping external cables down to the ground, then up to enter the house. Lightning goes for the easiest path to ground, so some of the discharge will go to earth at the loop, thus reducing the power that enters the house. There will still be damage but it will be less than would occur if the full power of the strike entered the house. You might further reduce the damage by running your aerial or satellite cable through an earthing bar at the bottom of the loop (or before it enters the house if you can't provide a loop at ground level). To install the earthing rod, dig a hole in the ground, place the rod into it, then back fill with moist soil, tamping down firmly as you fill. The earthing bar is connected by a stout cable* to an earthing rod, which is buried in the ground. This provides an easier path to ground, making it less likely that a large amount of energy will enter the house. *What sort of wire should I use to connect the earthing bar to the rod? Whatever you use is likely to vaporise very quickly in a strike! However, that doesn't matter if the distance is short (and it must be) because the ionised air will continue to carry the current for the microseconds duration of the lightning strike. Obviously, it doesn't have to be insulated (but insulation will protect it from the effects of bad weather). The thickest cable you can find in a scrap car. Take a look around the nearest car scrap yard. Steel fencing wire from an agricultural supplier. You may need to double-up if its diameter is small. The braided copper screening from coaxial cable, doubled over several times and twisted to form a thick "pigtail". Protect it from corrosion by applying a thick coat or two of outdoor paint. I have a friend, a geophysicist, who used to work in the oil industry and carried out seismic measurements and test drillings, mostly in remote desert regions of America and New Zealand. Lightning strikes were commonplace and the standard protection was to lay a circle or oblong of metal grid ("plegma") around the building, buried (horizontally) a few inches beneath the sand. Then plant metal rods vertically around the circle, connected together with stout wire or more "plegma". Because the desert ground was non-conductive (as in much of Crete) the metal grid was essential, since it formed a large capacitance coupled to ground over a wide area. The vertical rods - effectively earthed - attracted lightning away from the building and were easily replaced if they got zapped. Now, I can only report this as he told me. I can't guarantee success but it might be worth a try. In some properties it might be relatively cheap and easy to implement and doesn't require the buildings to be touched at all. >good as new. --- Many thanks. Sadly no such luck with the phone. In the Master jack socket is a gas-filled surge arrestor which will protect the telephone from *some* surges but not, of course, a direct hit on the line. We used to put two avalanche diodes in back-to-back series across the line in addition to the surge arrestor. The avalanche diode can't absorb much power but it reacts much faster than the surge arrestor and "grabs" the initial fast-rise time pulse before the surge arrestor takes over. I think the diodes were 200 volt devices. >the number you might need. Can you supply anything cheaper ? Yes. My mains surge arresting plug can be fitted to the end of the cord or into a (double) socket next to the plug of the unit(s) being protected. Bottom line is: you need ONE per *socket* not one per unit - so you can protect several pieces of equipment with just one surge arresting plug. This is not the same as a mains interference suppressor, BTW. It simply grabs momentary surges. Some give a visible or audible indication that they have been triggered and usually have to be replaced afterwards. Another good standby is a 30 ma Residual Current Breaker. Most modern houses have these. They are slow to react but they can limit the damage. >UHF TV & FM Radio aerial downleads. >I have had a look around on the Internet but so far without success. Direct hits on aerials are (thankfully) rare because they usually destroy all electrical wiring in the house and set fire to it! The usual problem is static build-up on the aerial and dish, caused by charged dust particles blown by the wind. The voltage increases until it reaches flash over point and discharges through the weakest point - usually inside the first unit in line (the satellite receiver RF modulator). The problem of static build-up on the dish can be eliminated completely by running a wire from all metal parts on the dish and connecting it to a grounding rod (typically a 3 foot copper rod or tube hammered into the earth). The TV aerial mast can also be grounded in the same way. Naturally this involves some expense but so does replacing your equipment! Additional protection can be provided by using a combined mains surge limiter and aerial surge limiter. In fact I can even supply one that protects the telephone as well! As mentioned above, mains surges can be limited by fitting a surge protection plug to *one* equipment mains cord in each socket or by simply plugging it into an unused socket at the same outlet point. In other words, supposing you have a TV, VCR, Satellite Receiver and Computer all plugged into one double wall socket with adapters. Simply fit a surge protection plug to *one* of these units (e.g. the TV) or just push it into a spare socket on the adapter without wiring anything to it. The surge protector plug will grab any spike that arrives at that particular wall socket outlet. (It will NOT protect equipment in other sockets a few feet away).